People are always asking me what my MAC must haves are so I thought I would begin to answer that FAQ here in segments! I will probably do a video on youtube.com/aglittery life soon giving more detail to what my MAC must haves are and the why behind it so head over there and subscribe so you don’t miss that!! I love the MAC PREP + PRIME line! There are two products that I use almost everyday from that collection. I love this highlighter! I use it mainly for my under eyes and for some highlighting on my nose and chin. It’s the perfect highlight for my fair skin and I find that it stays all day and has minimal creasing. It’s really important to set your makeup. I like to set my foundation and contouring, then set my face again after applying cheek color. I love to layer blush and this is an ideal product to use in between using a cream blush such as the NARS multiple in Na Pali and a powder blush like Benefit Rockateur. The powder keeps the multiple from sticking or catching when the powder blush is applied over it. 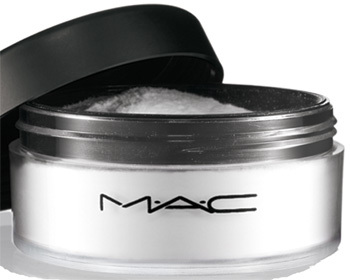 This is also my go to powder for setting my under eye area. It’s so finely milled that it goes one flawlessly! Don’t forget when using powders swirl your brush in the lid to pick up product and then tap off excess before applying to your gorgeous face! Next NARS 2014 Spring Collection Swatches!!!!! I love the Prep + Prime highlighting pen but perhaps I need to try the powder too.